At the end of my previous post, I posed the question: why did Latvia experience the deepest recession in the world in 2008-9? The first puzzle is that Latvia's banks were in no worse shape than anyone else's and better than some. Among small countries, Iceland, Ireland and (in 2013) Cyprus all experienced bigger banking collapses relative to the size of their economies than Latvia. Larger countries did too, notably Germany and the UK, both of which suffered widespread damage across their large and arguably over-developed banking sectors. In the US, the big banks were bailed out, but literally thousands of small ones failed. To be sure, Latvia did not escape unscathed: its second biggest bank, Parex, failed and was nationalised, and three other banks needed liquidity support. But that's really not sufficient to cause a recession of such magnitude. 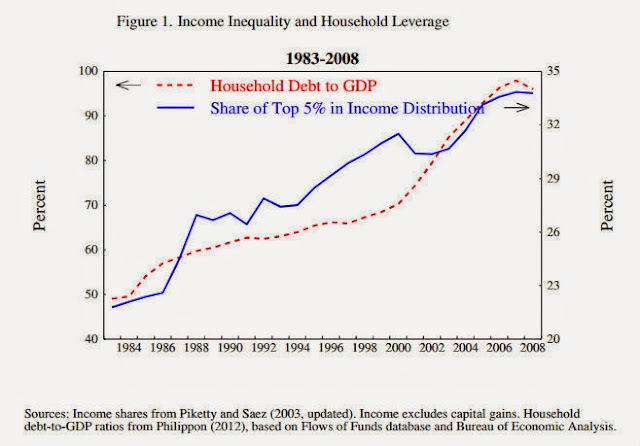 The 1995 crisis was much larger, but did not have anything like so great an economic effect. 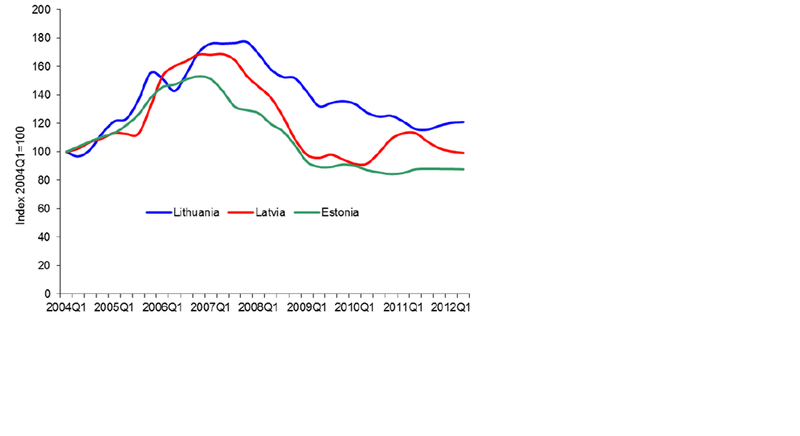 The chart below shows Latvia's long-run GDP growth rate (source: World Bank). Don't be distracted by the extraordinary fall in GDP in 1992: I've included that for context. 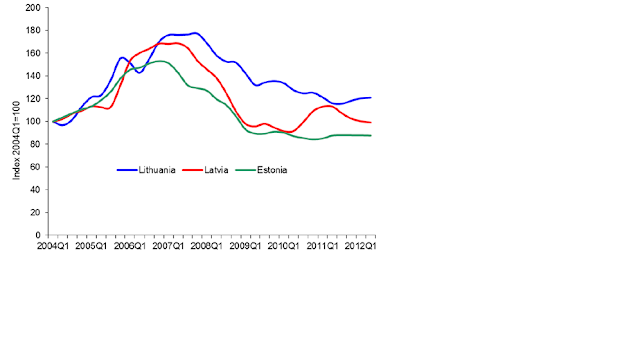 We may think the 2008-9 recession was terrible, but Latvia had experienced far worse within living memory. So where did they get the money? It's an all too familiar story. Inflows of foreign capital, mainly from Scandinavian banks, attracted by low interest rates and a population hungry for credit - credit advanced, of course, against property. Latvian house prices soared and there was a construction boom. Easy credit, wealth effects and incomes from construction and real estate activities also fuelled a consumption boom: suddenly Latvia, one of the poorest countries in Europe, was flooded with Porsches and Bentleys. 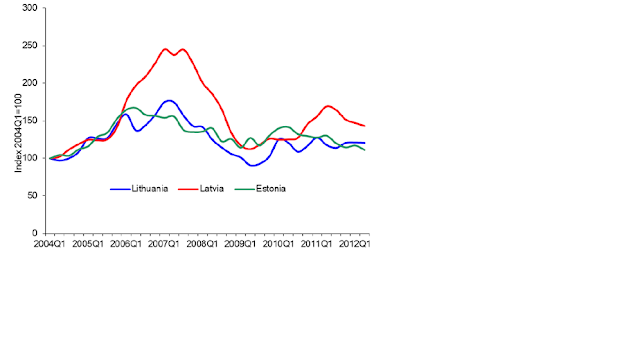 It is evident from this chart that Latvia's property bubble burst more explosively than either Lithuania's or Estonia's. Property prices fell by 60% between 2009-10. We now know that such enormous property market collapses have devastating economic effects. This is of course the cause of Latvia's dreadful recession. There was evidently a large wedge between house prices and rents in Latvia, which did not exist in the other states. The "housing affordability" chart is thus misleading. The house price rises were actually far more "unaffordable" in Latvia than in the other two states. 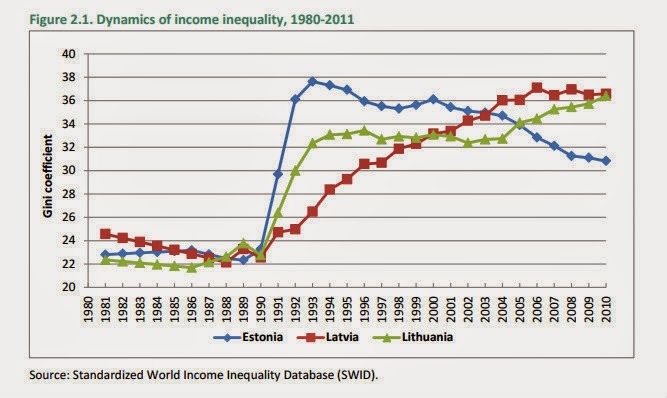 This suggests that Latvia had higher inequality. All three states had high inequality, a legacy of their abrupt transition to a market economy in 1990. But Latvia's was the highest. This explains why a property and construction bubble driven by excessive cross-border lending by Scandinavian banks was so devastating. Many Latvians were much poorer than the GDP per capita figures suggest, and it is these poorer Latvians to whom the Scandinavian banks were lending. But these generally poor Latvians were highly sensitive to interest rate rises and tightening of credit conditions. When they stopped borrowing, they stopped spending, and the economy collapsed. I have never seen anyone draw a connection between inequality levels and severity of financial crises when property bubbles burst. Yet it is clear to me, at any rate, that Latvia experienced the worst recession in the Western world because of high inequality in a generally poor country. Had income been better distributed among the population, and credit less well distributed, the damage would not have been so great. And this raises a question. Is the association between inequality and severity of recession peculiar to Latvia, or is it robust across other countries too? If it is, then it raises a serious question about our approach to economic reform. Reducing inequality and stabilising household incomes may be at least as important for financial stability as limiting the availability of credit. Clearly, more research is needed on the relationship between inequality, poverty and financial crises. The US suffered an even larger GDP contraction than Latvia (29%) in the ensuing Great Depression. For those who don't want to read academic papers, the authors have helpfully provided a blogpost on VoxEU as well. Oops , that should be Fazzari , not Fazarri. Plenty of non-economists , and a handful of economists , were talking about the connection before the crisis even occurred. Today , the only ones who still deny the connection are economists. Political shocks, institutional changes, and economic development play a major role in wealth inequality. 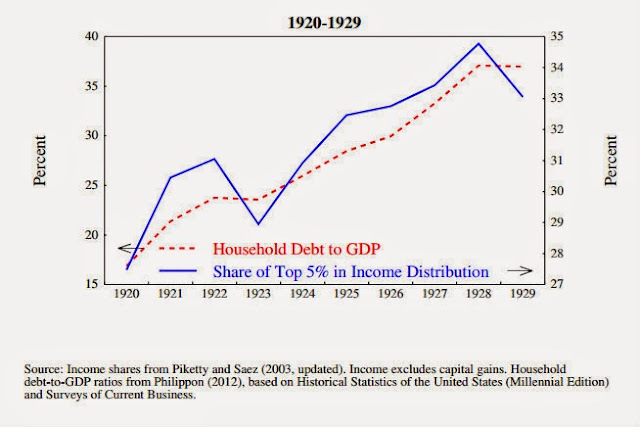 I do not view r>g (return on capital -"r" - outpaces the growth rate of the economy -"g"- over time) as the only or even the primary tool for considering changes in income and wealth in the 20th century or for forecasting the path of inequality in the 21st century. 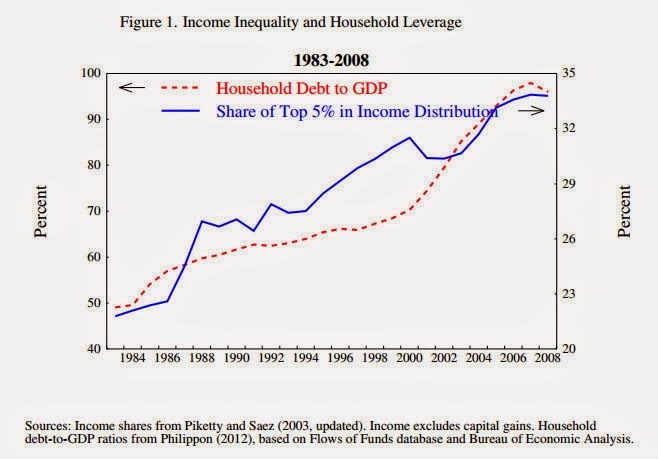 Piketty’s r > g doesn’t adequately differentiate among different kinds of capital with different social utility. Some people continue to defend trickle-down theories which assume that economic growth, encouraged by a free market, will inevitably succeed in bringing about greater justice and inclusiveness in the world. This opinion, which has never been confirmed by the facts, expresses a crude and naive trust in the goodness of those wielding economic power and in the sacralized workings of the prevailing economic system. Since it doesn't seem likely we will ever get rid of debt, during the next 10 years, what would you spend your debt on Frances out of, houses or stocks & shares? Create goods. Goods are the wealth offered and money does coordinate the distribution. In best case import products that allow you to benefit from other people knowledge invested for a certain period until you are in the position to recreate and evolve those. Assets are no goods. Real assets store real property and take away instability from fortune as a result from debt. In capitalism fortune/financial assets are not stable in general. 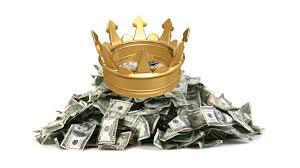 Credit money does finance the production of the next piece of a good which is advantageous for goods we buy in daily life but if you back your debt with a non-existent/not ready yet real world asset you pay the production of the next piece of asset but one. In the context of an existing enterprise it's easier, because there is something that exists so what is financed that way is the next 'asset' bearing interest hopefully backed by something that exists. Good old Marx once estimated. 3times the 'GDP' stored in financial assets leads to a bust (heard that from German Marxists), now they say 10 times. This factors are not a certain kind of truth but since every income is a loan (net salary monthly somehow) whose purchasing power does flow back 12 (turn rate 12) times a year I think the factor 10 is about 12 divided by 1,25 (current velocity M3 in the West). I doubt the phenomenon is a technical one - must have something with the fact that humans simply spend what they earn on a monthly basis and don't like to take money stored in savings. Net income avg. * income recipients in Mid. Europe is about the interest for government debt (not exactly). 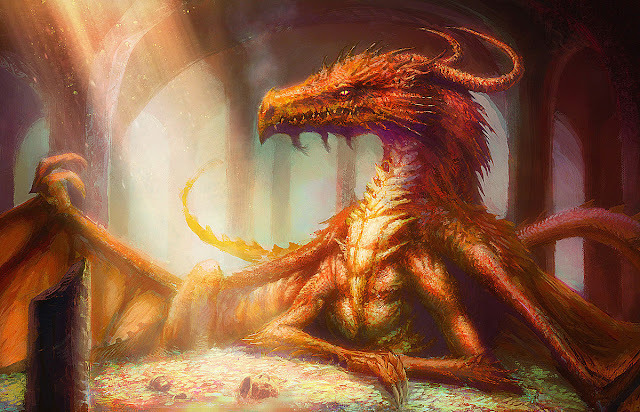 The crux is about looking one year in isolation and totally ignoring the turn rate of capital, since you should not remove money from a faster turning capital to a slower turning one assuming a similar profit rate/interest rate. Maybe in order to leverage and at least increase the turn rate of the self funded capital. Since most consumers don't know about the difference between purchasing power created and capital rotating in order to create that purchasing power ... that's human. Those who cannot save a lot think in monthly income and those who can in yearly income but none of those does think in interest from work which is what remains by the end of the month or is aware that money does not pay their work but finances the production of the goods they need. The turn rate of a financial asset is always 'one' independent from the reference period profits accumulate. 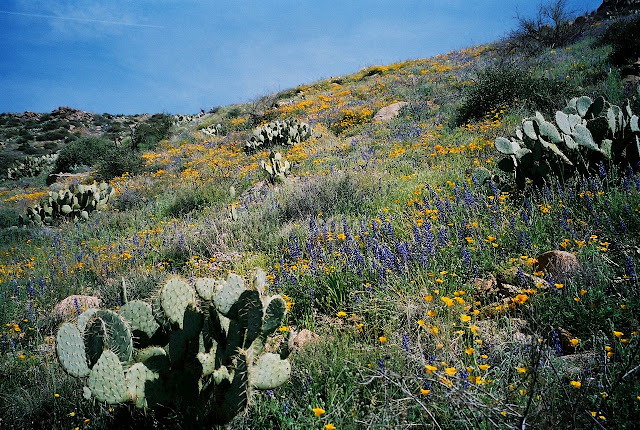 Imo financial assets invested in places where the investor is not participating in the process of interest creation. Money given away in order to invest from the provider's perceptive turns 0 time. What you get in return is the purchasing power offered. capital * turn rate * interest/profit rate = 0. With out growth of the real world transactions that's your profit. You achieved nothing on an avg. A blind spot. Money given away and working on something different but creating profit related to that investment is similar to consumption in a credit money systems used to finance an economy working according to the concept of division of labour. From the flow of the investment capital it's the same. Goods at a certain price are equal to purchasing power but just goods are wealth. Provision vs. distribution. That's why open source works pretty good for software. In order to create an asset in general you can either invest time or a certain kind of capital from private equity (maybe you act as an investor and pay your work:)). Software has bugs which is not reflected in the industry model - repair - you know:). So interest from external sources is required - fixing bugs in software works in growth scenarios if we think of a real world industry comparison. So it turned out to be more wise to work and improve on what you need, based on something offered for free since no barter is involved, eventually share your improvement and donate or contribute money in order to allow other to grow their fortune ... for further investments. Never forget money does never pay your work. You get it in order to hand it over and finance goods you need and cannot work on for different reasons. If I had money (debt) - which I don't - I hope I would have the courage to be a business angel, providing equity finance and business expertise to small innovative companies. Good analysis of role of housing in Latvia. Thanks.